COLUMBIA, S.C. (AP) — South Carolina’s offense was supposed to be a highly efficient, quick moving machine this season. Instead, the Gamecocks‘ attack has been sluggish in South Carolina’s two biggest Southeastern Conference games so far. Everyone agrees the Gamecocks need to quickly find their offensive rhythm to turn the season around. “We just have to make the plays that come to us,” Gamecocks receiver Deebo Samuel said Tuesday. The Gamecocks (2-2, 1-2 SEC) will try and crank things up against high-scoring Missouri (3-1, 0-1) on Saturday. Under the direction of new offensive coordinator Bryan McClendon, South Carolina worked on improving its offensive tempo, quicker reads and featuring a more varied offense. All the pieces seemed in place with junior quarterback Jake Bentley behind center and a host of returning playmakers in receivers Samuel and Bryan Edwards and healthy tailback Rico Dowdle. But the Gamecocks have come up short in critical showdown games with No. 2 Georgia (41-17) on Sept. 8 and No. 13 Kentucky (24-10) last weekend. Against the Wildcats, South Carolina fell behind 24-3 in the opening half and Bentley had just three yards passing the first 30 minutes. There were at least six dropped passes, including three combined by the typically reliable Samuel and Edwards. South Carolina’s offensive SEC numbers show improvement — it ranks third in passing and sixth in rushing — yet its results tell a different story. Muschamp hoped these problems would be a thing of the past when he let go of longtime offensive coordinator Kurt Roper and elevated McClendon to the position last December. It looked like the perfect move when Bentley and the Gamecocks rallied from 19-3 down in the final 20 minutes to beat Michigan 26-19 in the Outback Bowl last January as the Gamecocks finished 9-4, their most wins four seasons. The attack has rarely looked that good this year. Against Georgia, South Carolina managed only 54 yards rushing and saw the game slip away with the Bulldogs 21-0 third quarter. The Gamecocks passing game struggled at Kentucky with Bentley finishing 148 yards passing, much of that coming on a 58-yard TD pass to Samuel where the Wildcat defender made an early jump on the pass and missed — springing Samuel for the score. Bentley hurt his knee in the second half. He has received treatment since, but was at practice and Muschamp said was probable to start against Missouri. Edwards, a junior like Bentley, is also expected to play despite a sore ankle. 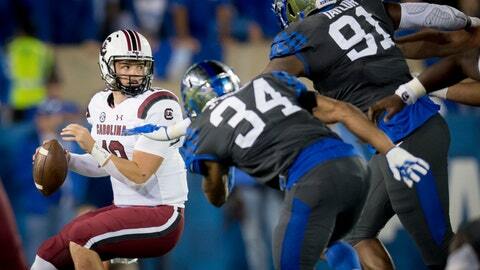 South Carolina left guard Zack Bailey is confident it’s not too late to turn things around. He said some of the offensive players might not have been fully locked in during earlier losses. Bailey believes that will change starting with Missouri. Missouri is coming off a bye week. In their last game, the Tigers fell to No. 2 Georgia 43-29. Tigers coach Barry Odom said his players worked hard during the off week and are anxious to return to action at South Carolina. Muschamp is seeking the same thing by paring the game to its basics.